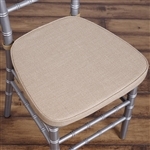 At Razatrade.com, we help you to add a sophisticated grace to your seating area with Value Plus Polyester Chiavari Chair Cushions. In this section, we offer exclusive chair cushions such as Tables and Seating Chiavari Chair Cushion – Gold, Tables and Seating Chiavari Chair Cushion - Royal Blue and more. These wholesale priced Chiavari Chair Cushions are made from high-quality polyester fabric, which offers a soft touch, elegant look, and seamless pattern. The fabric also provides resistance from stain, wrinkles, abrasions and shrinking. These bulk priced Value Plus Polyester Chiavari Chair Cushions are ideal for creating a perfect chair setting on wedding ceremonies, engagement parties, retirement parties, cocktail parties and other indoor or outdoor events. Razatrade.com offers affordable Value Plus Polyester Chiavari Chair Cushions, which will definitely provide comfortable seating to your guests. Why buy Value Plus Polyester Chiavari Chair Cushions from Razatrade.com?